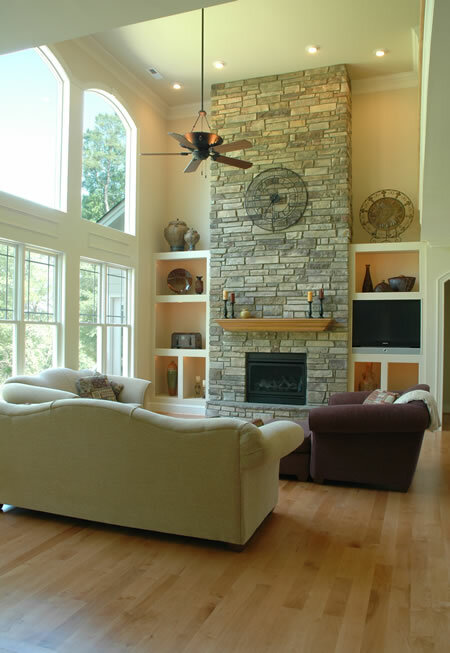 Create a Comfortable and Inviting Space for Your Family! 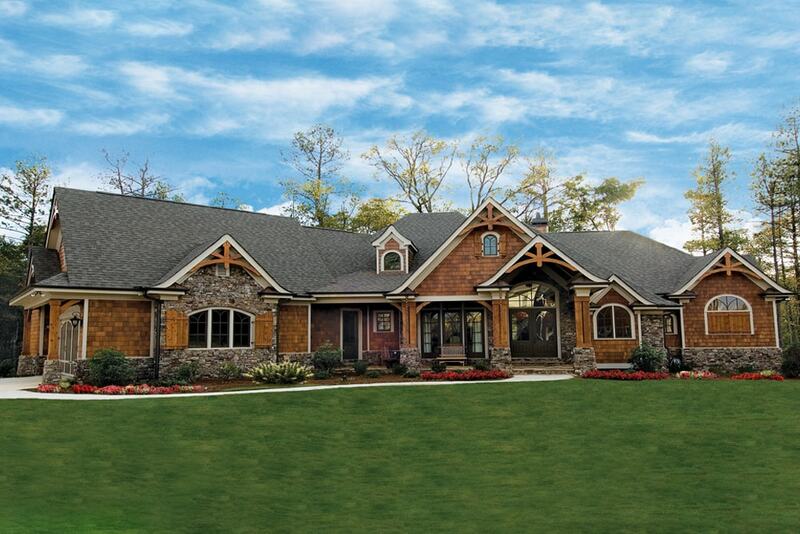 Inspired by the idyllic aesthetic of English manor and Old World rural estates, 2-story Country house plans are all about warmth, comfort, tranquility, and harmony with nature. Picture tall shade trees, a creek, lush greenery, and a charmingly quaint home with a wide inviting front porch. Not far behind the Craftsman in popularity, the Country style home has been around since the 18th and 19th centuries. While its historic origin is not as clearly defined as the Colonial, Arts and Crafts, and bungalow styles, two-story Country home designs are highly influenced by 18th century colonists who adapted European styles to regional conditions. The first country homes were built with whatever materials were available locally to the American settlers. Most of the time, this meant basic stone and brick exteriors with textured interiors and wood floors. The original look of exposed beams and rough textures is preserved in today’s modern country home. The stone exterior, rough textures, and exposed beams of the original Country style homes are on display in this magnificent 2-story, 3-bedroom modern-day Country home with Craftsman influences (House Plan # 198-1001). 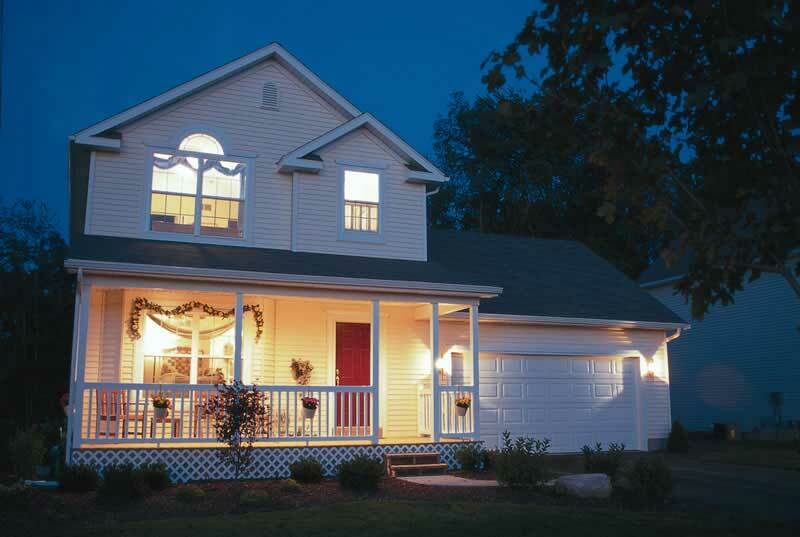 What Defines a Two-Story Country Style Home? Classic charm and beauty: Clean lines, a gable roof with asphalt shingles, and symmetrical windows on both floors enhance the curb appeal of this captivating 2-story, 4-bedroom, 2.5-bathroom Country style home with Farmhouse influences (House Plan #178-1080). While Downing was actually describing a cottage, what he said applies to a Country style plan – where comfort, warmth and a leisurely-paced lifestyle reign supreme. The Country home plan is a broad design category that overlaps with farmhouse, cottage, Craftsman, traditional, and Arts and Crafts styles. All these homes come with lots of windows, gable roofs, shutters, and other features that are on the “must-have” list of homeowners. 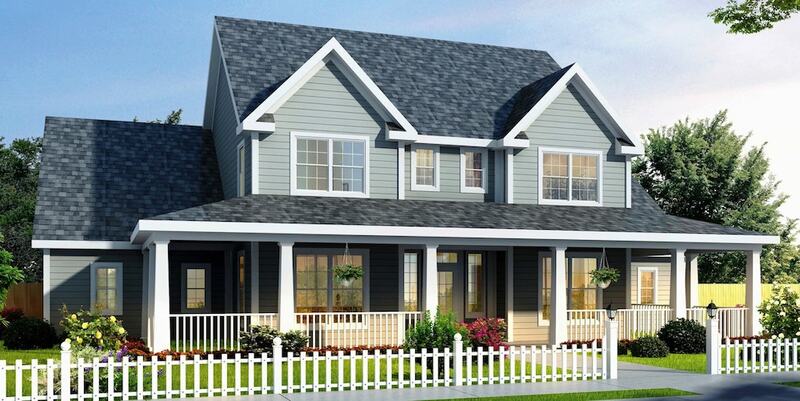 So what is there not to love about these architectural elements of 2 story Country house plans? 1. 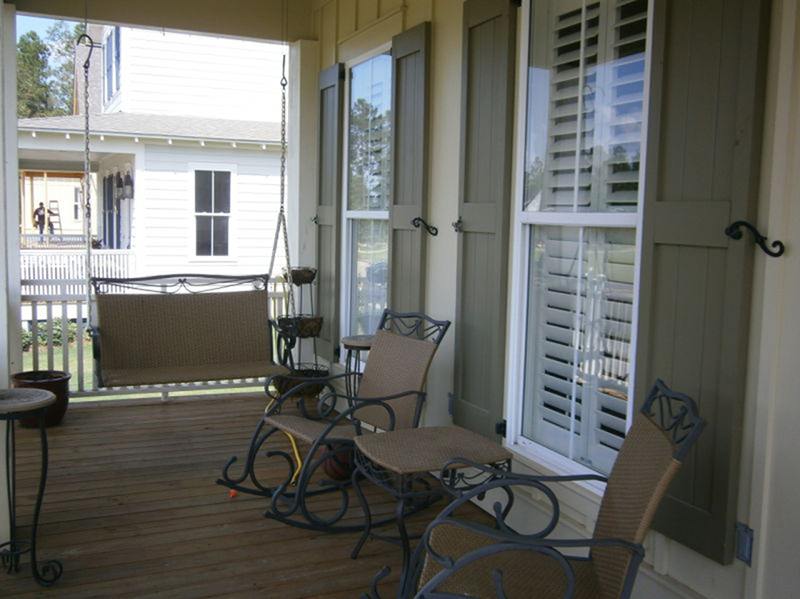 A front porch – from the wraparound to a side one – is the most iconic feature of a Country home. It’s not only a place to relax and unwind, but the spot to welcome guests and keep up with the neighborhood – just like in the “old” days. A wide and inviting front porch decked with hanging flower baskets is the ideal spot for unwinding in this 2-story, 3-bedroom Country style home (House Plan #126-1297). 2. A gable roof, one of the most popular roof designs in the U.S. and a definitive characteristic of the Country home, is described as a triangle made up of two sloping sides that meet at the top. A gable roof is easy to build and vault and less expensive than other roof styles, and it allows room for an attic or a loft. This 2-story, 2-bedroom, 1,480-square-foot Country home comes with a simple gable roof. Inside the home are high vaulted ceilings and an open floor plan (House Plan #126-1287). 3. Lots of windows with decorative shutters are de rigueur and allow ample natural light into the home. Check out the multi-pane windows on both floors of this 3-bedroom, 2,489-square-foot Country home with two garage bays. Shutters complete the look of the many windows that provide natural light into the home (House Plan #104-1062). 4. 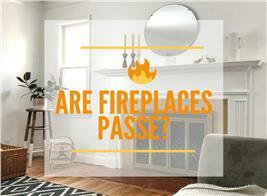 Most of the time, a fireplace is on the “must-have” list of homeowners. But in a country home, a fireplace is a mainstay. For the early settlers, the fireplace provided their main source of heat, so it was around the warm fireplace that families gathered to enjoy the coziness of their home and each other’s company. 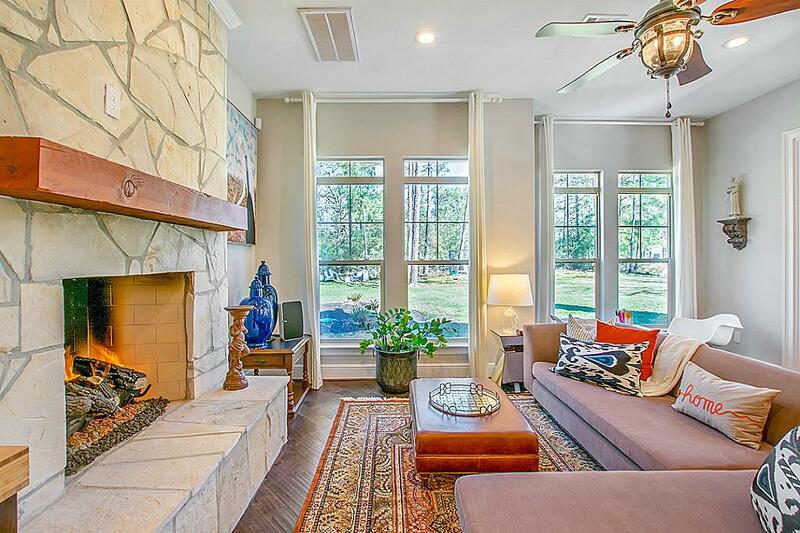 Sit back and unwind in the warmth of the wood-burning fireplace in this hearth room of a luxurious 4-bedroom, 5.5-bath, 4,501-square-foot Country home (House Plan #153-1121). 5. Decorative wood accents and rustic touches are an important part of the Country home’s appeal. Detailed woodwork on exterior railings, exposed beams on the ceilings, and other vintage-look fixtures create an informal and casual ambiance in the home. Top: Take a second look – decorative woodwork just below the wraparound porch is a reason to turn around and take another look at this 3-bedroom, 1,002-square-foot Country home (House Plan #126-1218). 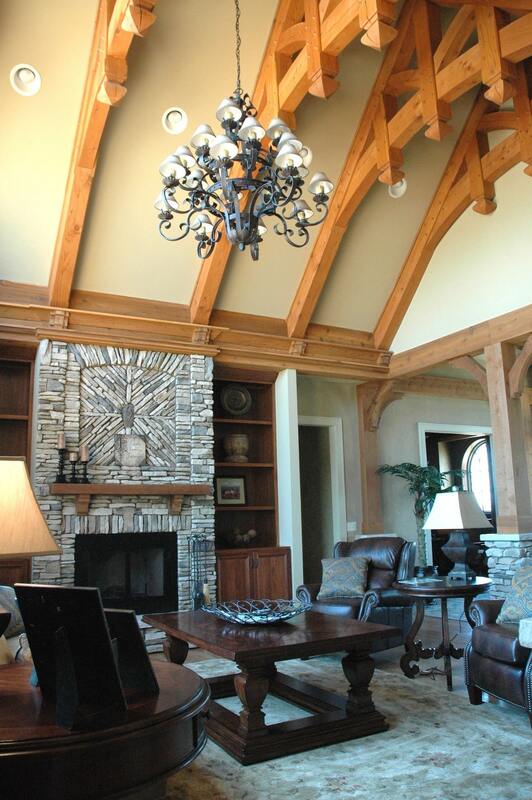 Bottom: Inside the family room of a 3-bedroom, 2.5-bath home are attractive patterned exposed beams on the high ceiling, wood trim on the fireplace mantel, and shaped corbels on the wood posts (House Plan #198-1001). 6. In the spirit of connecting the indoors seamlessly to the outdoors, 2-story Country home plans most often include verandas and private decks for master suites. 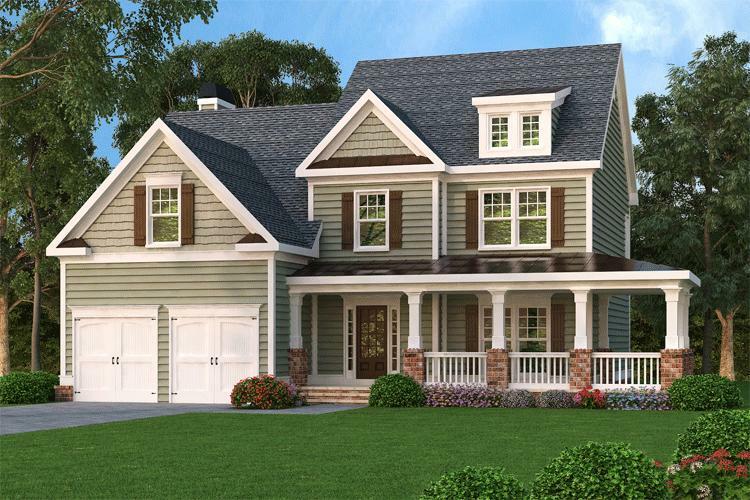 Open wide the doors, and step onto the private upper-level dedk of this 3-bedroom, 2.5 bath Country home to enjoy that fresh breeze and smell the flowers (House Plan #126-1286). 7. Lots of space – With the ability to build out instead of up, Country homes provide plenty of square footage for families. From homes with about 1,000 feet of square footage to ones with up to 4,500 square feet or more, the Country plan offers the flexibility for families to grow into the space. From the early homes during the 18th century to the 21st century model, the Country style home has remained one of the most enduring and endearing designs across all regions. Its features are not only attractive and appealing, they are also practical and functional. 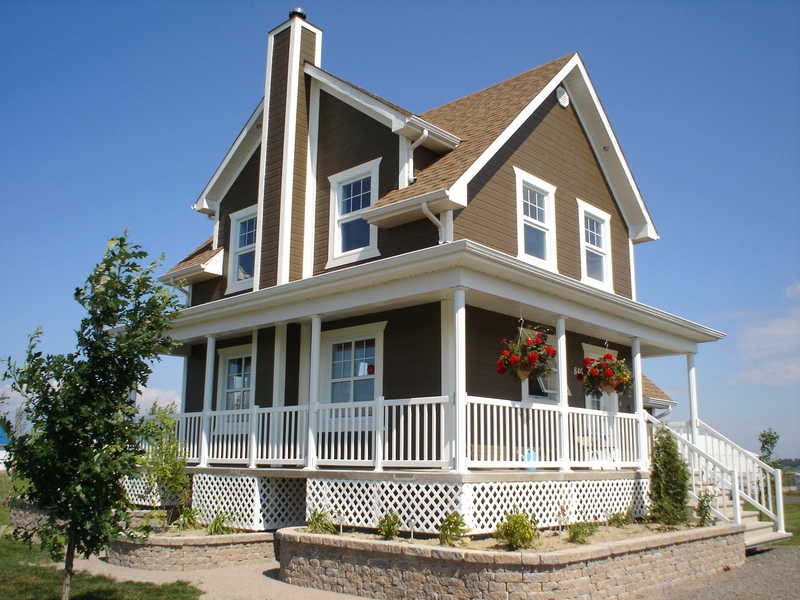 Country home plans also provide homeowners with the flexibility of choosing a one-story or a two-story style. Here’s why 2-story Country floor plans make sense. 1. Versatility in design options and features to fit any lifestyle – For families who love to entertain, a two-story Country home allows them to adapt the design to accommodate all social spaces – like a grilling porch, patio, family room, media room – on the first floor. That means private decks, children’s bedrooms, a study, a library, and a laundry room on the upper level. 2. More space in two floors – While Country homes are built on fairly large properties, you can’t beat the space spread out over two floors. 3. 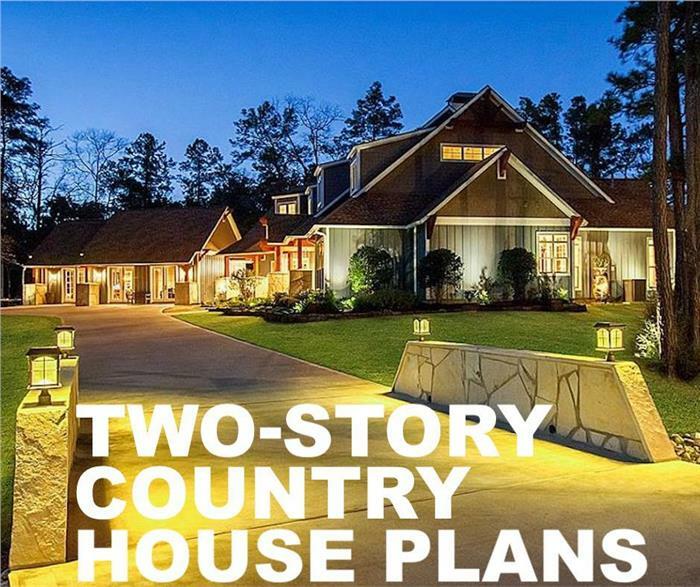 Flexibility – With a two-story Country plan, families can go as big and as wide as they want with some of the downstairs living spaces – think kitchen, Great Room, dining area, and even the front porch. In such a plan, all bedrooms are located on the second floor – which is the preferred arrangement for families with small children to have that peace and privacy from all the activities going on in the entertainment spaces. In some instances, families who plan for the aging years prefer to have a main-floor master suite. Top: This 4-bedroom, 3.5-bath Country home with the signature inviting front porch has all the bedrooms situated on the second floor. Middle: The main floor contains all of the social and living spaces. 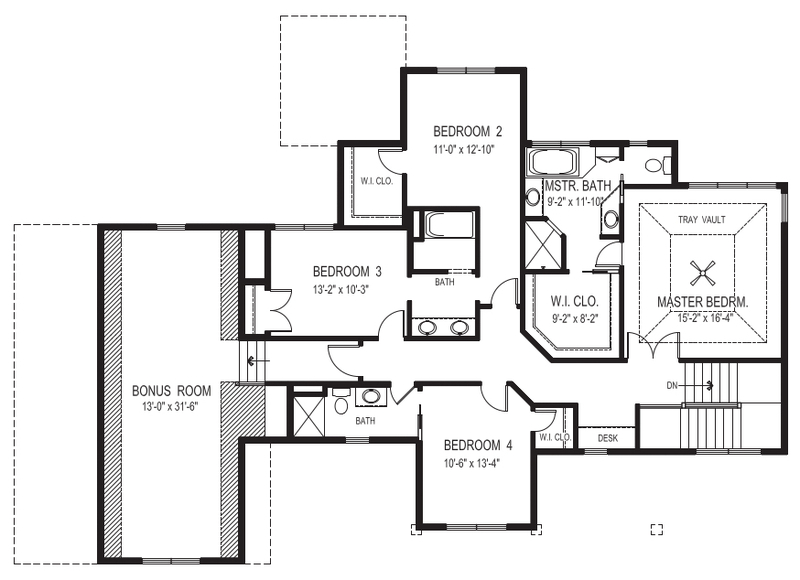 Bottom: All of the bedrooms – including a bonus room – are located on the second floor. 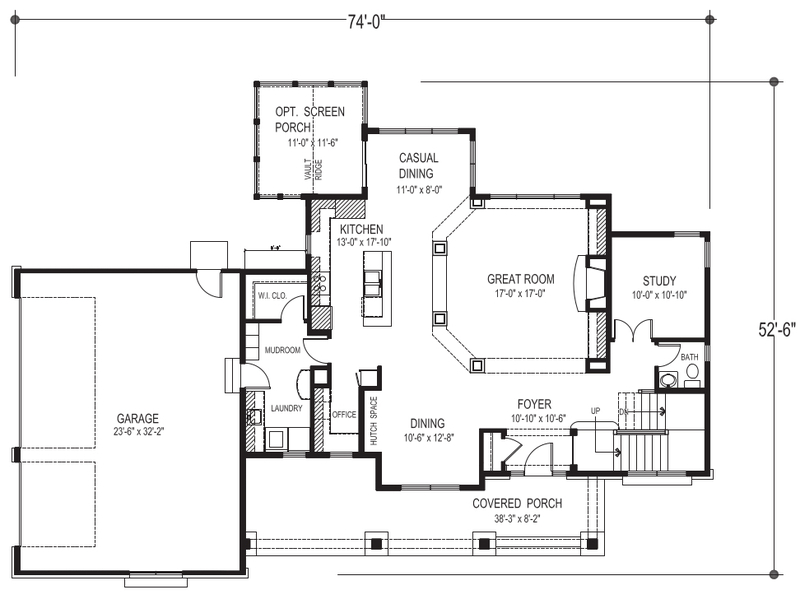 (House Plan #109-1191). 4. Potential for expansion – If you need more living or social spaces, there are parts of the two-story Country home that provide options for expansion. For example, there’s the vaulted roof where you can build a loft for a teenager or an older child. An in-law or guest suite can be added to the basement. And it doesn’t have to occupy the entire floor. 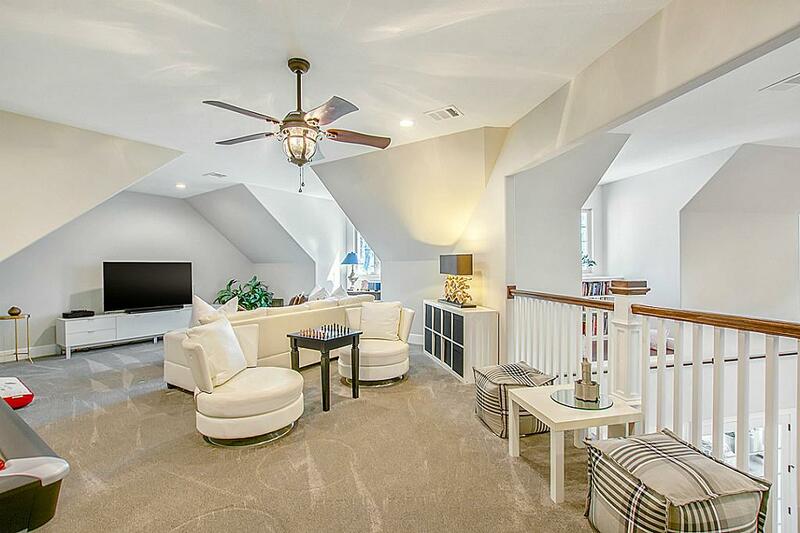 Part of the basement can be converted into a game room, family room, or another sitting room where family and friends can gather. 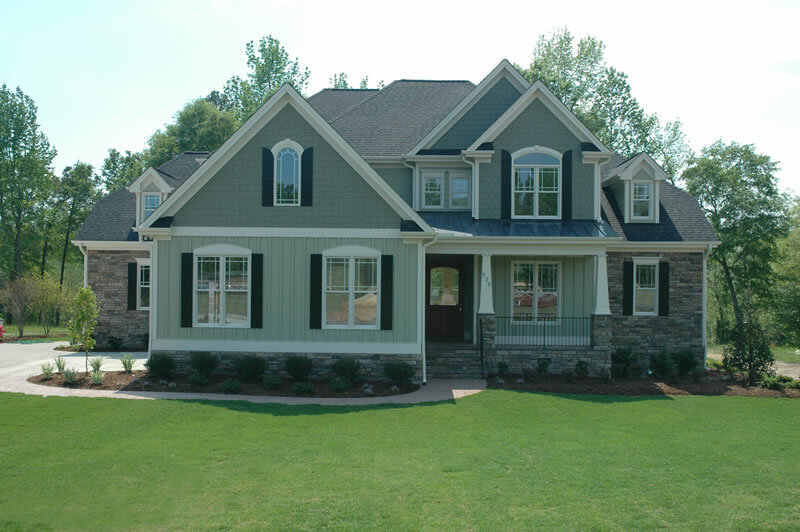 The beauty of the Country house plan is its broad design category. From the quaint cottage to the artsy Craftsman, the timeless farmhouse, and the contemporary traditional home, there’s a “Country” for every lifestyle. According to Downing, “tasteful simplicity not fanciful complexity is the true character’’ of a cottage. And in simplicity, there is true appeal in the quaint architectural style, with the small porches, bay windows, gable roofs, and dormer windows. While cottages have a smaller footprint – from two to three bedrooms and one to two bathrooms – they often have all of the comforts and amenities of larger homes, such as open floor plans, high ceilings, modern kitchens and appliances, and home offices. Top: This charming Cottage with a landscaped front yard, flowers, shrubs, and tall shade trees at one side features 3 bedrooms, 2.5 baths, and 2,185 sq. ft. of space. There is a cozy front porch, a screened-in side porch, main-floor master bedroom with an ensuite bathroom, and an office. Bottom: A close look at the front porch shows comfortable rocking chairs where one can sit and enjoy the scenery (House Plan #142-1096). 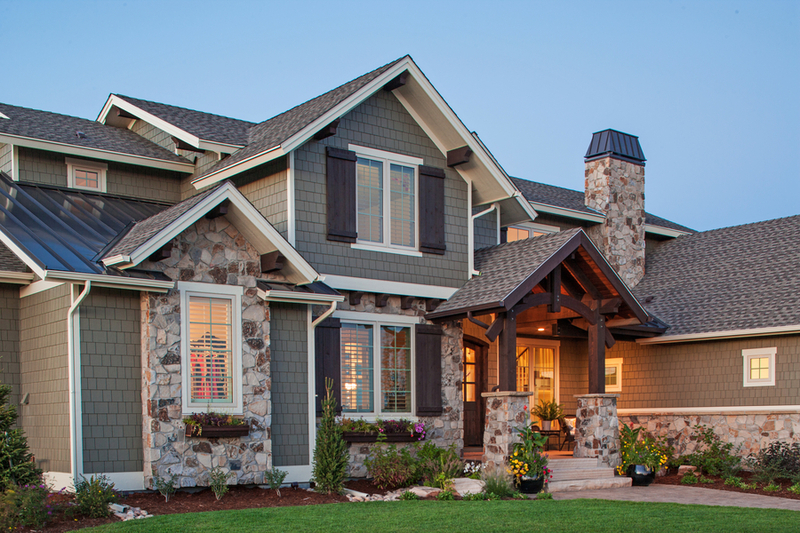 The popularity of Craftsman style home plans is undeniable as both first time homeowners and preservationists look to build or buy these homes to preserve and restore the original and add some modern touches of their own. The Craftsman style, which gained prominence at the tail end of the Victorian Era with its elaborate and ornate fixtures, simplified house forms and ornamentation. As Gustav Stickley, its most famous promoter noted, “… its low broad proportions and … lack of ornamentation gives it a character so natural and unaffected that it seems to … blend with any landscape.” This is not to say that Craftsman homes are bland and colorless. On the contrary, they are some of the most fascinating. With their sturdy, bold, solid structure; exposed woodwork; clean lines; and use of natural materials, Craftsman style homes exude elegance in their simplicity. Top: A Craftsman-influenced Country home in all its glory: With its gable roof, multi-pane windows with wood shutters, stone façade, and covered porch with exposed beams, this 4-bedroom, 3.5-bath home plan has all the beautiful exterior features of a Craftsman home. 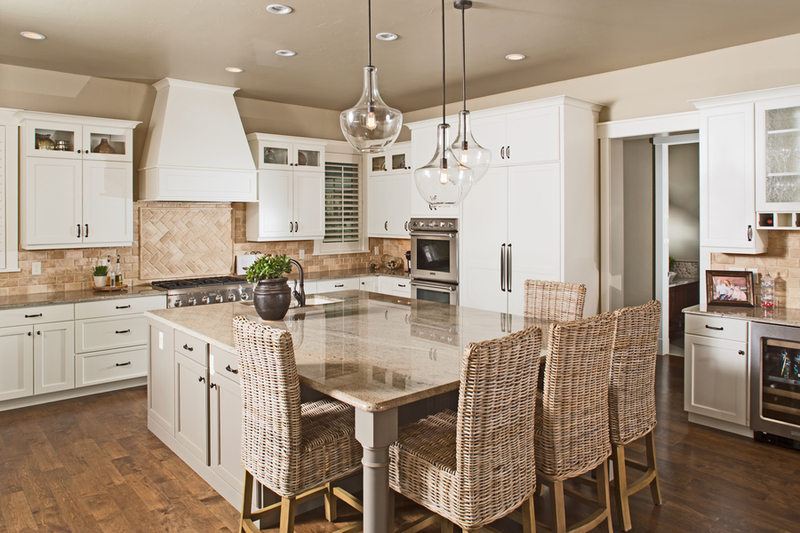 Bottom: Inside the home is this stunning modern kitchen featuring state-of-the-art appliances and handcrafted dining chairs positioned around the kitchen island (House Plan #161-1067). Designed to be practical, straightforward and purposeful, Farmhouse home plans are one of the most captivating and enchanting portraits of Americana. These plans embody the concept of a home built in the countryside on a large scenic property or open space. Even with the luxury amenities of the modern world, the farmhouse remains a timeless and sought-after style. With its comfortable and inviting front porch, dormers, wood siding, interior fixtures and accents, the farmhouse continues to evoke that warmth, tranquility, and comfort of the original designs. 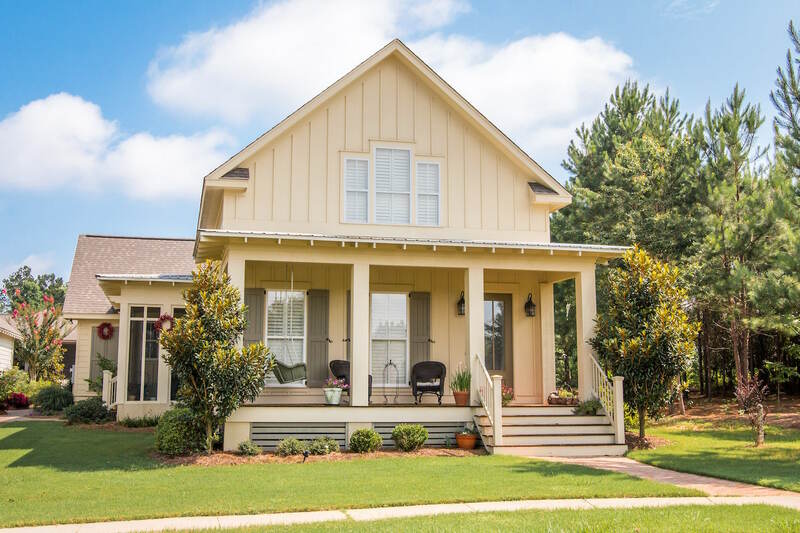 The cozy front porch of this quaint 3-bedroom, 2.5-bath Farmhouse style home is the perfect star-gazing spot! The home has an open concept design with a Great Room (living/kitchen/dining areas), fireplace, family room, and bedrooms on the second level (House Plan #120-1368). One of the most commonly built house style in the United States, the Traditional house plan has a broad appeal – resonating with new homeowners, growing families, and empty nesters. Consistent with the Country design, the Traditional plan may have covered porches, simple rooflines, symmetrically spaced windows, and up-to-date essentials. The Traditional style home – like the Farmhouse – is built to be functional but comfortable, warm, welcoming, and equipped with all the convenient and modern features of daily living. These include open floor plans, state-of-the-art kitchens and appliances, family room, home-office, main-floor laundry room, mud room and more. Top: This 4-bedroom, 3,124-square-foot Traditional home has all the iconic features of the style: simple rooflines, symmetrical windows, a front porch, and stone exterior. 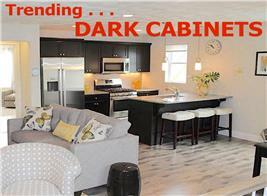 Interior elements include an open floor plan, fireplace, main floor master suite, home office, and main-level laundry. Bottom: Inside the home is a warm and comfortable family room with a fireplace, large windows, and glass doors that open to the outdoors (House Plan # 120-2176). With the spiraling costs of homes in major urban areas, potential homeowners are looking to buy or build homes in the country or suburban areas. Just imagine what you can build on a large property in a “rural” area for a fraction of the cost of a city home. 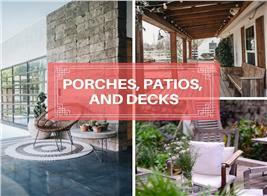 There are endless possibilities for styles, size, and amenities. 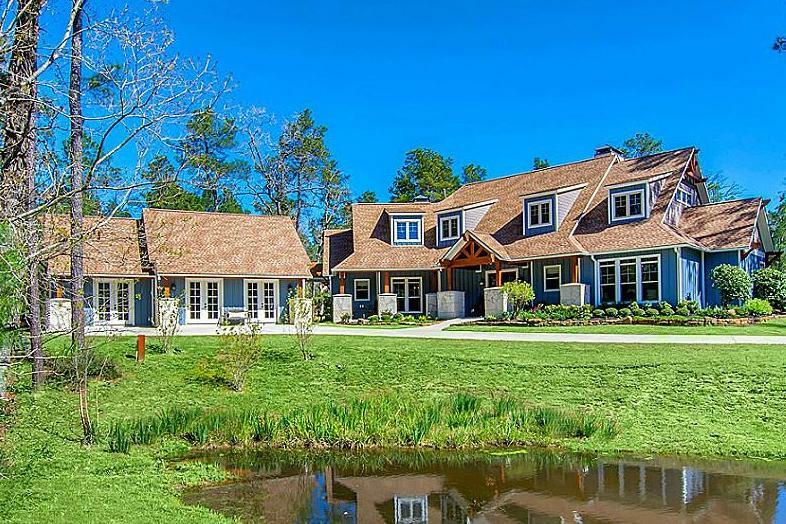 Here’s a look at a wonderful Country style home that includes four bedrooms and 5.5 baths spread over 4,501 square feet of living space. The main floor encompasses 3,398 square feet and the upper level, 1,103 square feet. 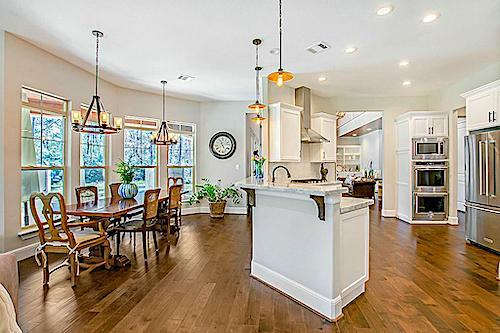 From Top to Bottom: This glorious Country style home includes a creek and a landscaped entryway to the home; the covered front porch has Craftsman touches seen in the exposed wood beams. 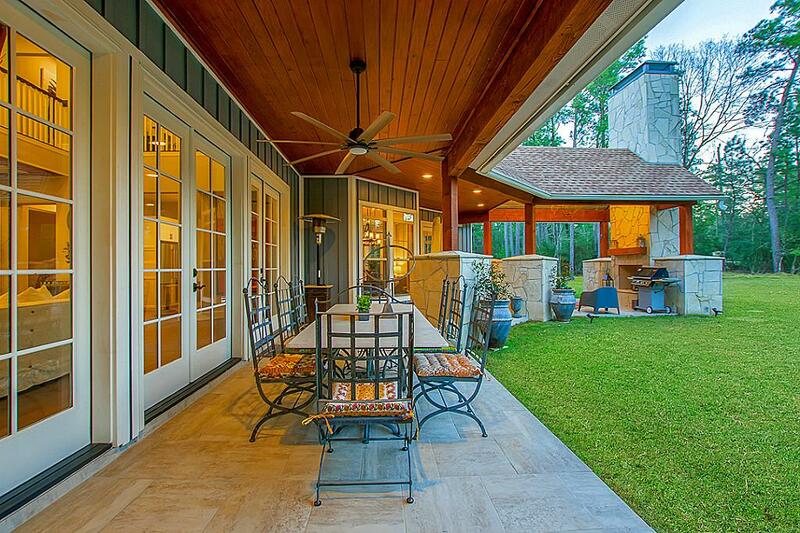 Country homes feature interiors that link the exterior spaces seamlessly, and you can’t ask for more that this outdoor living space and covered grilling porch – with access from the Great Room and the hearth room. 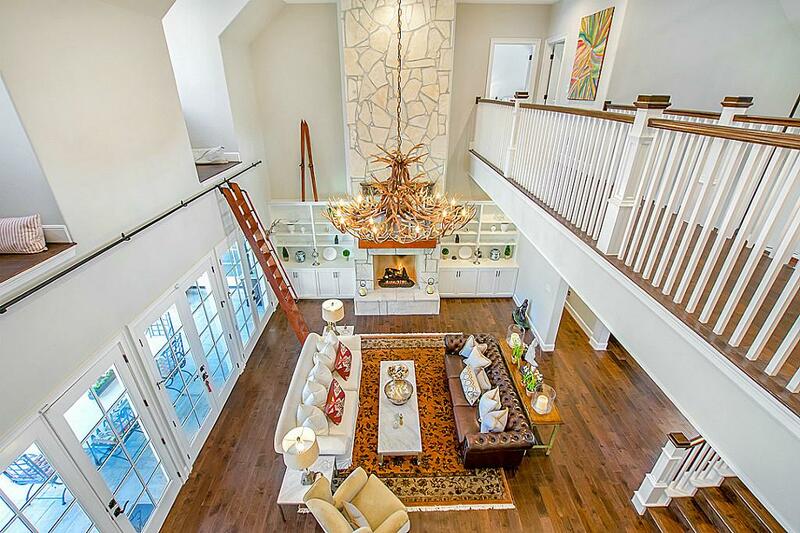 The stunning Great Room with its fireplace and eye-catching chandelier is viewed here from the second story. The first stop on the upper level is a beautifully furnished bonus room/theater room from which one can look down and see the Great Room. The very modern kitchen – with its all-white cabinetry complemented by stainless-steel state-of-the art appliances – includes a breakfast nook; large windows provide terrific views of the outdoors. 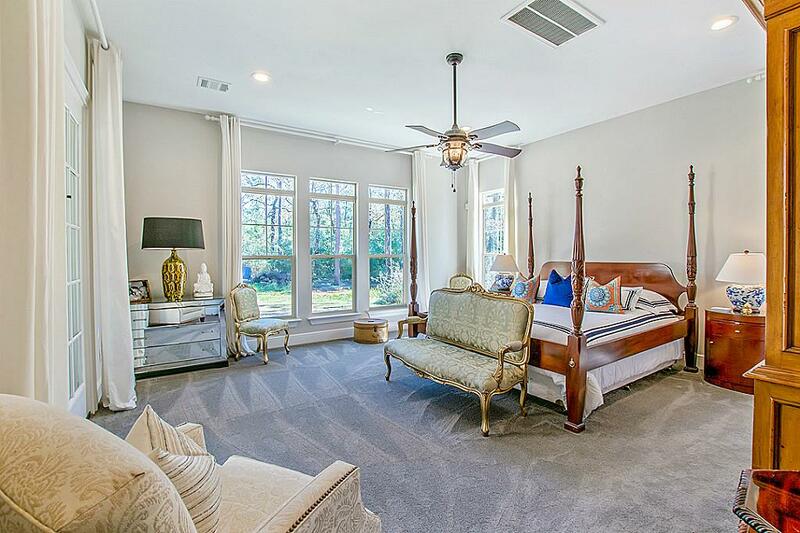 The luxurious main-floor master bedroom is light and ariy – and features a sitting area. 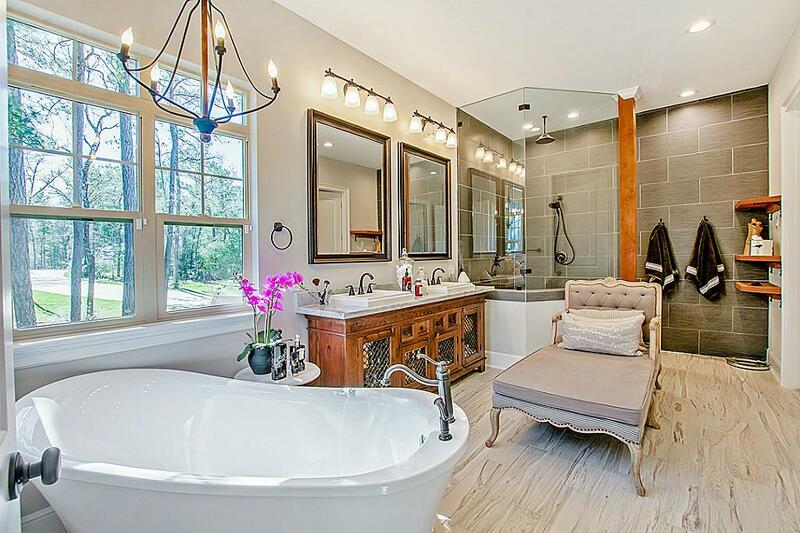 The spacious ensuite master bath has spa-like amenities like a restful chaise, rainfall shower, and pampering clawfoot tub (House Plan #153-1121). Even as the Country home has stepped into the 21st century, the design concepts of “tasteful simplicity” and “producing beauty by means of form and proportion” advocated by Andrew Jackson Downing still ring true! Footnote: The lead image in this article shows a night view of the magnificent 2-story, 4-bedroom Country style home shown directly above.